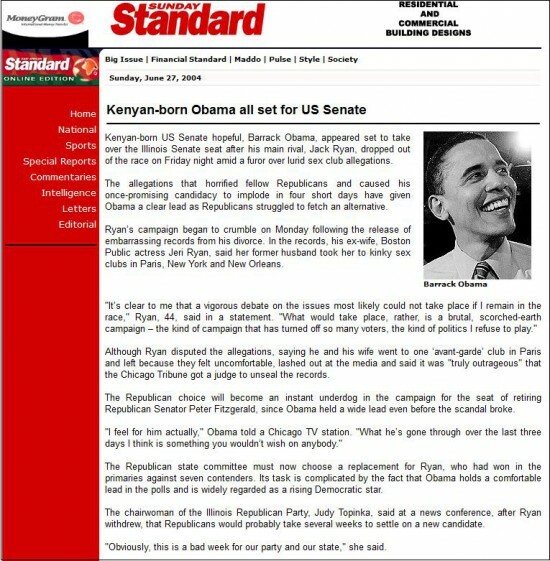 On June 27th, 2004 a Kenyan newspaper published an innocent story of one of their native sons who was moving up the political ladder in America. That native son was Barack Obama. 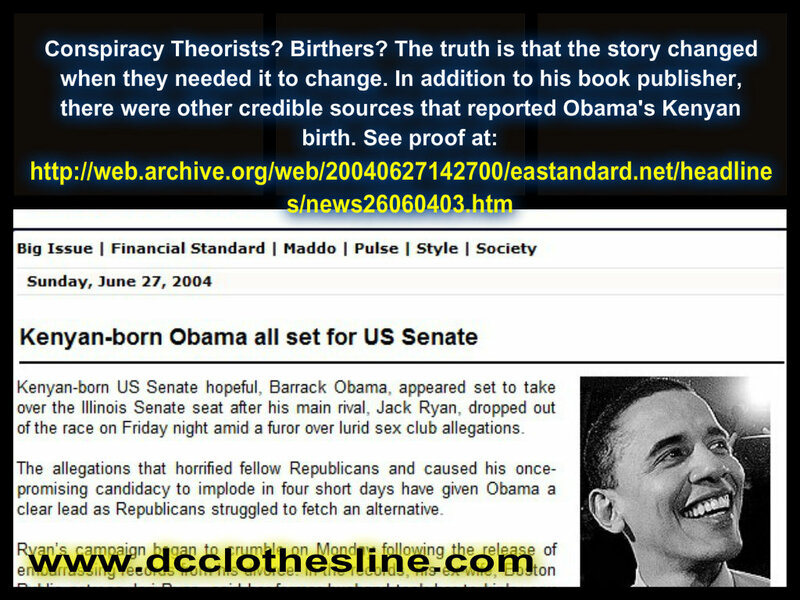 Notice that the story is not a “birther” story and raises no objection to Obama’s eligibility. Foreign born citizens are allowed to be elected to the Senate and the House of Representatives, so in 2004 there was no reason to hide this information. This was a simple news story about a Kenyan-born man who was making a name for himself in America. Who would have known that this man would become president? If you visit the Wayback Machine, this article is still archived for all to see. The East Africa Standard is one of the oldest and most respected news sources in the region. The story has been taken down for reasons unknown. A cover up is not out of the question, but this is a copy of an article that was once published and available online thanks to the wonderful technology of the Wayback Machine. I did some checking because I wanted to see what kind of story may have been used to “debunk” this. If you read the article you will notice “–AP” at the end which would indicate it came from the Associated Press. That is only partially true. The AP wrote about 90% of this story and The Standard added the part about Obama being born in Kenya. Some who argue against this piece of evidence simply say that since the AP didn’t really write 100% of this story then it is not credible. Really? Do you mean the same AP that was caught faking all of those Sandy Hook photos? Another argument is the different spelling of Barrack (two r’s). Really? Is that the best you’ve got? People with agendas are not hard to spot. They will argue for their guy no matter how irrational they get. Does this article prove anything? I think it does. 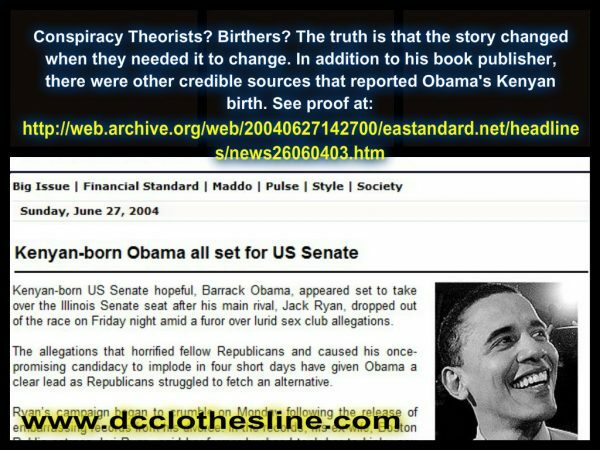 It doesn’t prove Barack Obama was born in Kenya, but it darn well proves that someone should take it seriously enough to investigate. It amazes me that we can have newspapers and book publishers state that Obama was born in Kenya, long before he ran for president, and people won’t even listen to that logic. If you want to call me a “birther” then I will accept that label. But in 2004 there was no such thing. Think about that.